Rachel J Homes is thrilled to market this Beautifully Presented Retirement Bungalow on the popular development Lansdown Gardens, North Worle ideally situated for easy access to local shops, amenities and transport links. If you are looking for somewhere that you can "just move in" then make sure this is on your list to view. The accommodation briefly comprises of Entrance Hall, Lounge, Kitchen, Two Bedrooms, Bathroom, Front and Rear Gardens and Parking. Added benefits of this lovely home include double glazing and there is no onward chain. Accompanied viewings - CALL NOW to book yours but BE QUICK!! Wood and glass door into hallway, night storage heater, loft hatch, doors off. UPVC Double glazed window to front, range of wall and base units with work surface over and tiled splash back, built in electric hob with electric oven under, space for washing machine and fridge freezer, stainless steel sink and drainer with mixer tap over. UPVC Double glazed patio doors to rear, night storage heater, coved ceiling, tv point. UPVC Double glazed window to rear, night storage heater, built in wardrobe with shelves and hanging, storage cupboard housing water tank. UPVC Double glazed window to front, coved ceiling, night storage heater. Panel bath with electric shower over and hot water mixer shower, pedestal wash hand basin, low level W/C, extractor fan, part tiled walls. All measurements are approximate and cannot be relied upon. All items in photos are not included unless specifically stated. Rachel J Homes have not tested any equipment or services & cannot verify the working order. Any references to the tenure of a Property and/or to any service or other charges are based on information supplied by the Seller and has not been verified. Checking the availability and booking an appointment with Rachel J Homes is advised prior to travelling to see any property. 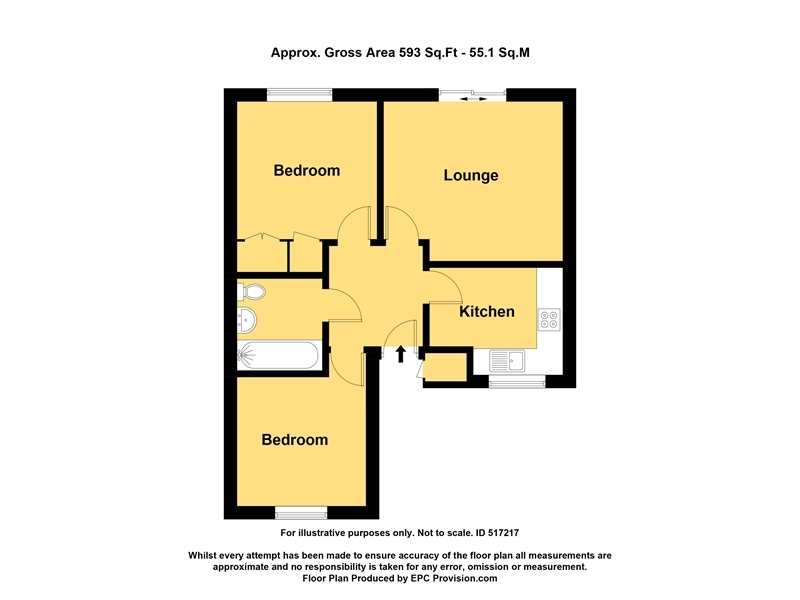 The Floorplan &/or EPC Rating are provided on behalf of the seller of the property by a third party and delivered to Rachel J Homes to use as a guide only and cannot be relied upon. Rachel J Homes assumes no liability or offers no warranty as to the accuracy or validity of the information and provides them for general guidance purposes only. Maintenance monthly charge £156.00 - includes Lawn cutting, Window Cleaning, Gutter Clearance, 24HR warden help link. General maintenance of the communal areas.